The NFL and its locked-out referees have agreed to a contract, according to a statement from the NFL, and the regular officials will be on the field for Thursday night's Cleveland-Baltimore game. 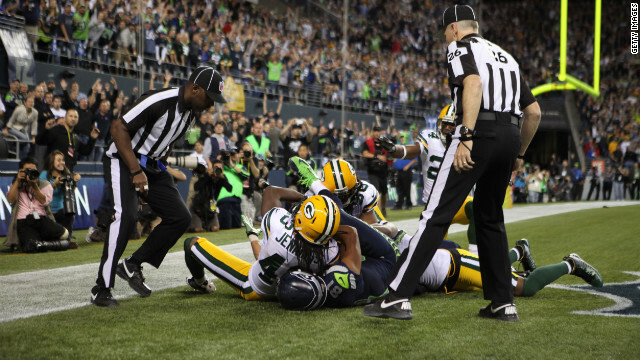 The league has used replacement officials for the first three weeks of the regular season, as well as the pre-season, an a string of bad decisions have become fodder for jokes and criticism, highlighted by a game-deciding call on Monday night in the Packers-Seahawks game. Even politicians have gotten in on the act. Reports throughout the day Wednesday indicated a deal was close, and the NFL even reported that the sides were closing in on an agreement. Though the regular refs have been sitting out the league's games, they should be ready when the time comes, according to Sports Illustrated's Peter King, who says that longtime ref Ed Hochuli has held training sessions to keep them sharp. Packers must be sooo happy! you know, this whole thing would not have been so bad if the Pack D'Back had just batted the ball away and not had to satisfy his ego with an interception... but i guess we won't hear any more complaints now that they're back!! You know, I love professional football, but this latest instance of how powerful the NFL owners are has really taken the wind out of my sails as a fan. I hope the refs got something they were asking for, and I'm glad they're back!! They're getting salary increases from an average of $147,000 now to $205,000 by 2019 for twenty games officiating, plus an increase in league matching for pension contributions. I wish I had a piece of that action. what does considered for NFLRA membership mean? What are they considered while working in the developmental program. Does this mean they can become refs without joining the NFLRA? Are we still union busting here? Are apprentice plumbers in the plumbers union? Now we don't have to hear whining fans, whining players and coaches, and all calls will be correct – NOT! Actually Joe, people betting on Football are even happier. An estimated 150 million dollars was lost because the Packers lost the game and much of that money will not be given back. Football is one of the easiest sports to gamble on now and the lack of officiating was really putting a damper on a good system. oh well, I want to see everyone shake the hand of each and every man that is returning to the job they are obviously well trained for and can do better than most. I never want to hear a single complaint about any of these men again, much less from those overpaid crybabies........hmmm, is that the palyers, owners, or league officials......if the shoe fits. FREEDOM OF SPEECH!!!??? IF you think we have it you better look again! WE as fans raise a rucus about these refs, who were making BAD, BAD, calls, YET the NFL fines players for saying the same thing? I can understand if you physically attack or touch a ref., in soccer if you do you are thrown off the field. There are more and more cases of people "speaking their minds" and getting fined or put in jail? It is becoming more and more evident that if you say something you had better make sure who is listening! I am voting D in November, and I'll outvote you. I'm sheltered, well fed, utility subsidy, prescription drugs, kids in school with free lunch, all on your dime. And I watch alot of sports. So, you shut your mouth and get back to work and pay taxes so I can continue my life of liesure, beeatch. Who is working for who now? I think it's entertaining that a Chicago fan was glad that the Packers got screwed on a call by replacement refs, lol. But seriously, I made the statement a few days ago to some fellow fans, that if my team (Chiefs) get screwed by a call like what happened on MNF, I will contact the Chiefs owner Mr. Hunt and let him know that not only am I not watching the Chiefs anymore but I'm not watching any NFL game and I certainly am not going to buy any tickets to a game. I was beginning to think that this was the only way to ge the regular refs back.. hit the owners in the bank account. This isn't about complaining about bad calls. This is about players safety, and frankly about the replacement refs safety. There was an increasing chance that a player might "accidentally" run over a ref during a play, or a fan throws a heavy small object at a ref or a player and hits them in the head, etc. The integrity of the game was being damaged. I'm very glad the regular refs are back. Some players will have to return to abiding by the rules. Most of the time anyway, compared to seldomly with the replacement refs.